Providing you the best range of conveyor belt installation with effective & timely delivery. 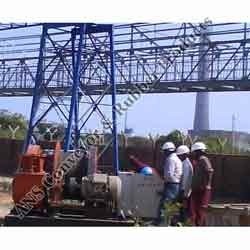 Being an eminent company, we are involved in rendering Conveyor belt Installation Service. Winch positioning and alignment for belt pulling. Emergency Services: ANS is geared up to limit your downtime during an emergency. Fast response with a complete shop for back end support is provided to get you back up and running. Sufficient full time experienced belt technicians. Great BMH Experience: ANS takes great pride in having the most experienced belt technician staff to service the Belt splicing of Steel chord as well as Fabric belts by Hot and Cold. In fact, each year we work over at least 6,000 hours in BMH field. 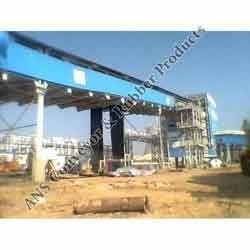 Belt Fabrication: ANS has a large fabrication shop to complete a variety of services. Our experienced staff can help you with services like: slitting/cutting, hot, cold or mechanical splicing; cover grooving; hole punching; cover skiving & recovering belts. Field Services: Our expertise serves many different industries such as Mining, Power Plants, Shipping Terminals. We provide a variety of field services including belt installation, splicing & repair, longitudinal rip repair with specialized vulcanizer, pulley lagging & installation, inspection reports/trouble shooting & complete belt maintenance. Looking for Conveyor Belt Installation & Repair Services ?